Adurel has been a leader and innovator in the roofing and waterproofing industry for almost 40 years. Our foothold today expands into renewable energy; manufacturing polymer roofing systems with superior sustainability and energy conservation. Adurel roofing products benefit both the environment and customers; and our contractors are extensively trained to ensure flawless application. 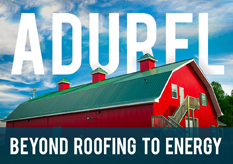 A polymer built-up roofing system, Adurel is designed for long-term reliability in any climate and on any type of roof. Meeting the highest Energy Star requirements, this advanced roofing system reduces energy costs and is tax deductible when applied over an existing roof.